Are you getting into a workout routine to keep the pounds off over this Festive season? Boost your workout with active gear from Under Armour, as they are offering up to 30% off selected items, and shipping is free for orders over $60! Check out our top picks below: UA Charged Bandit 3 Now $74.99 (Was $99.99) UA Storm Hustle II Backpack Now $32.99 (Was $54.99) UA Tech™ V-Neck Now $14.99 (Was $24.99) Get moving before those pounds pile on, sign up with us now to get the first 1lb free shipping! Free Shipping (Within the US) This Holiday! The Ho-ho-hoooooliday is upon us, and here is a comprehensive (and expansive) list of online shops based in the US that offers free domestic shipping! Dont forget to set your shipping country to the US to take advantage of these deals! 1. Babies and Kids – Beaba – Babylist – Toys R Us 2. Cards and Prints – Vista Print – Shuttefly 3. Electronics and Gadgets – ABT – Dell – Best Buy – Acer 4. Fashion – Eddie Bauer – LL Bean – Mansur Gavriel – Lively – Coach – Lands End – Net-a-Porter – Barneys – Sephora.com – Morphe – Free People – Gap 5. Home Decor – Wayfair – Pottery Barn 6. Bags and Luggages – Ebags – Herchel 7. Multi-Product Brands – Luulla – Overstock – Target – Walmart – Amazon 8. Sports – Puma – Fushoes Remember, most shops have a cut off date of..
Planning for kids’ presents are not always hard, but it always helps to plan in advance. How about starting for this upcoming holiday season with these great deals, that mostly comes with free local shipping. Register with us and we will make sure that it will get straight to your door! Toys that are good for learning and education The Learning Resources have 70% off and free shipping within the UK for all their online catalogues! Here are the best deals on their site: 1. Pretend & Play® International School Set Specifically for ages 3-7 this toy set is to set kids to enter school by preparing them with skills while they play. At 60% off – this is a good bargain for a good cause! 2. Buy It Right™ Shopping Game A board game that teaches your kids to value money, this board game is like a kid’s version..
We have the best selection of Cyber Monday deals for you gamers! 1. Sony – PlayStation®4 1TB Console in Black Best deal in a while for a PS4 is now made available to you this cyber Monday! At USD$100 off the original price, you can get yourself your favourite game with the money you saved! 2. Sony – PlayStation 4 Pro Console This 4K enabled version of the PS4 is now available on discount at USD$349.99. This combo also includes the Destiny 2 game for free! 3. Microsoft – Xbox One S 500GB Console The best deal on an X Box One S is here! Save almost USD100 on this deal. Get the best deals at the cheapest prices, and get them shipped cheaply right to your doorstep with us. Sign up now! Best Laptop Deals on Cyber Monday! Gone were the days where you are stuck on a desk because you are working on desktops. These days, laptops are made stronger and built to last and at a very competitive price. We’ve scoured the internet to find you the best deals : 1. Apple 15″ MacBook Pro with Touch Bar (Late 2016, Silver) at USD$1799 (save USD$600!) Best deal for Apple’s MacBook Pro with the task bar that is not to be missed! A bargain, saving you over USD$600! 2. Microsoft Surface Pro + Black Cover Type Cover combo! A deal with over USD$300 off! 3. HP Laptop – 15-bs045nr​ The cheapest laptop with and Intel i7 processor without compromising on the style – get this with over USD$500 saving! 4. Samsung Chromebook Plus Transition from your android from to your chromebook plus at ease, with free shipping and a saving of USD$500! 5. Lenovo Yoga 720 It’s.. Towards the end of the year, many people are ready to take time off on some VACATION (or staycation – whichever you prefer!) either with friends or loved ones. At those times, you want to make sure that you are ready for some merry old picture taking, so you better be ready with a good piece of equipment – A CAMERA! Here is our selection of what are the best Cyber Monday deals from the people who know cameras best, B&H Photo! 1. Nikon D3400 DSLR Camera with 18-55mm Lens (Black) The perfect entry point DSLR, this Nikon comes with a sizable lens is a steal at just under USD$400! B&H is also offering free ground shipping! 2. Canon EOS Rebel T6 DSLR Camera with 18-55mm and 75-300mm Lenses Kit With a great set, and if you prefer Canon over Nikon, this is definitely a great start for any shutterbugs.. This Post is for the Audiophiles! For most people, the need to keep your ears filled with music, or anything other than outside noise is an essential part for our daily lives. Think about the number of gym days cancelled because you left your earphones at home, or how you chose to go back up that elevator because your headphones were not in your bag, where it is supposed to be? Here are our top picks for the best ear extensions this Cyber Monday! Undoubtedly Sony’s 1000 series took the reign for best noise cancelling ear extensions of 2017. We found two deals on Amazon for this, depending on your preference! – Sony Premium Noise Cancelling, Bluetooth Headphone in Grey Beige (MDR1000X/C) – Sony Sony Premium Noise Cancelling Wireless Behind-Neck In Ear Headphones – Black (WI1000X/B) Both with two colour options, you’ll find it a crime to get either (or both) of these at prices at..
Every year, the number one resolution made by people is to keep fit (or other fitness related goals). In this list, we’re showing you the best deals online on fitness trackers available this Cyber Monday! 1. FitBit (offer ends at 3PM today so make sure to not miss out!) – Fitbit Blaze The best seller for fitness tracker on Amazon is now on USD$50 off on the fitbit site! With three colours to choose from, it’s a bargain at USD$149.95! – Fitbit Flex 2 A simple, no fuss fitness tracker that fits in a band, bangle or pendant form and also available in 3 attractive colours is a steal at USD$59.95! Get it here. – Fitbit Charge 2 You want to monitor your heart rate too? Fitbit Charge 2 also allows that on top of other stunning features of this simple band design fit tracker! Available now in 4 colours..
Do You Get Lost in The World of K-Beauty? Every time you walk down the streets of Myeongdong in Seoul, or confused everytime you enter a K-beauty store? We’ve got you sorted! With SokoGlam’s BlackFriday/CyberMonday 30% off everything in store, it’s hard not to take advantage of the offers! 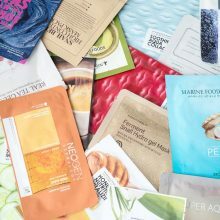 Any typical k-beauty routine includes these steps, and the pro choices for each step : 1. Cleansing Oil Cleanser : Moringa Cleansing Balm It does what you expect a cleanser to do and more! It breaks down makeup, dirt, excess sebum, and pollution on your skin’s surface and works to build natural collagen to prevent fine lines and fight the signs of agingas well as promoting smoothness and softness to the skin. Water Cleanser / Toner : Son & Park Beauty Water It creates a clean base for the next steps in your skincare and makeup routine. The Beauty Water is not just a cleanser but it mildly exfoliates to..
We’ve got you covered with the best deals this Black Friday/Cyber Monday weekend! Adidas : Get up to 50% off on selected sneakers! Click here! Top picks : Prime Knit NMD Shoes at 30% off! Gazelle Shoes also at 30% off!